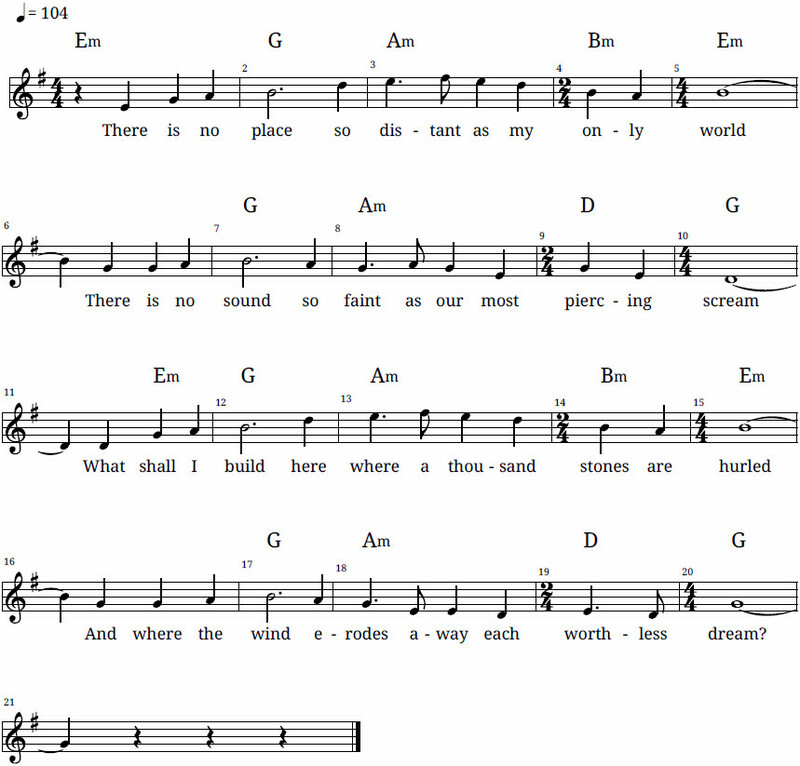 There are several old posts on this blog about music that I composed when I was younger. But as a teenager in the nineties I also composed some fragments that never became complete songs, and I’ve not yet blogged about those. So here is a selection. The lyrics are brimming with teenage angst, and are also rich in words I thought of as inherently poetic at the time. If any of them inspire you, you’re welcome to adapt them in your own creative works. All I ask is that you let me know. Most of the recordings below were made expressly for this blog post, and are not polished performances. Their purpose is simply to demonstrate the tune. When I remember that the thought is too absurd. I wait unsatisfied, in pain and almost screaming. When I remember that the thought has not occured. There is no sound so faint as our most piercing scream. And where the wind erodes away each worthless dream? This one is about being abandoned by a valued friend. The second verse would have included the line, “And I’ll walk to infinity again today” (invoking a sense of aimlessness). Watching silence greet every desperate cry. Watching memories freeze as they pass me by. A few years ago I wrote the above fragment into a story — as previously mentioned here — and also included this one. Where’s the ground to hold them? To finish, a fragment that is only one line long, but which I’ve always thought has potential for a pop song. Unwelcome conclusion of a painful illusion. I hope these brought you pleasure, and that they don’t evoke your current state of mind. But you have my sympathy if they do.